January 2008 seemed like a good month for the Democratic Republic of Congo. As the BBC reported: "Rebels and militia groups in eastern Democratic Republic of Congo signed a cease-fire agreement aimed at ending the conflict that continued to rage after the end of the country's 1998-2003 war." That war and its aftermath are estimated to have killed more than 5.4 million people. But that doesn't mean that the DCR isn't still mired in a terrible humanitarian crisis. In January, 2008 the NEW YORK TIMES also reported that the Congo's death rate has remained unchanged since the war ended. "[It is] estimated that 45,000 people continue to die every month, about the same pace as in 2004." Today the Congo still hosts the largest UN peacekeeping mission. 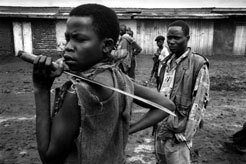 Renowned Photojournalist Marcus Bleasdale has now spent eight years covering the brutal conflict within the borders of the Democratic Republic of Congo and the work was published in his book ONE HUNDRED YEARS OF DARKNESS. Photos by Marcus Bleasdale. Used by permission. Congo's bloody history is long. Attracted by the land's immense wealth of natural resources, in the 1870s King Leopold II of Belgium set up a colonizing venture. Such was the potential wealth that in 1885 Leopold declared the establishment of the Congo Free State  with himself the sole head of state. Leopold's colonizing ventures were brutal. Historians estimate that millions of Congolese perished under harsh laws and brutal work regimes. The horror of life in the Congo interior was retold in Joseph Conrad's 1902 novella, HEART OF DARKNESS. Mark Twain added to the literary furor over Leopold's regime with his 1905 satirical pamphlet KING LEOPOLD'S LAMENT. If I had them by the throat! [Hastily kisses the crucifix, and mumbles] In these twenty years I have spent millions to keep the press of the two hemispheres quiet, and still these leaks keep on occurring. I have spent other millions on religion and art, and what do I get for it? Nothing. Not a compliment. These generosities are studiedly ignored, in print. In print I get nothing but slanders -- and slanders again -- and still slanders, and slanders on top of slanders! Grant them true, what of it? They are slanders all the same when uttered against a king. The Belgian state annexed the Congo in 1908 due to the growing international protests. Belgium's hold on the land gradually lessened throughout the century and independence was granted in 1960. Unrest continued after independence and in 1961 the prime minister Patrice Lumumba was overthrown and assassinated by the forces of army leader Joseph Mobutu. Mobutu, who seized complete power in 1965, became internationally famous under the name of Mobutu Sese Seko and also renamed the country Zaire. For decades the country was an important ally of the United States in operations against neighboring Angola, backed by the Soviets. Mobutu's Zaire ranked high on international indices of corruption. Conflict broke out in 1997 as the Rwandan conflict spilled over the border in a search for Hutu fighters and anti-Mobutu rebels ousted his government. Laurent Kabila was named president and the country renamed again as Democratic Republic of Congo. The war, however continued on for five years between government forces who were supported by Angola, Namibia and Zimbabwe and rebels supported by Uganda and Rwanda. In 2001 Laurent Kabila was assassinated and replaced by his son Joseph. Joseph Kabila was elected in 2006 in the first democratic election in decades. As BILL MOYERS JOURNAL reports, the DCR is still in turmoil. As noted above, in January 2008 the government and rebel militia signed a peace pact to end conflict in the eastern part of the country. However, reports from Doctors Without Borders document renewed fighting in those areas. And, according to the Council on Foreign Relations, The Democratic Republic of Congo has the worst record of sexual violence in the world. On March 31, 2008, the UN Security Council lifted arms embargo on DRC government. Arms bans are still imposed on the other parties to the conflict. On April 3, 2008 UN agencies of UNICEF, UNDP and UNFPA signed a new five year program action plan for the country, for the years 2008 to 2012. Published on April 4, 2008. George Lerner reports for FRONTLINE WORLD on the July 2006 election which was the first competitive vote in more than 40 years. Marcus Bleasdale's comprehensive and engaging site contains hundreds of his photographs from his work in the Congo, Chad, China, Somalia, Rwanda, Nepal and other areas. You can also sign up for his podcasts from the field. The BBC's country profile includes a up-to-date timeline, historical and current news coverage and links to major in-country news sources. Mark Twain's 1905 satirical "defense" of King Leopold's harsh rule over his personal African kingdom raised awareness in the United States. Mark Forum discusses the new documentary "King Leopold's Ghost," which looks at the atrocities of Belgian colonial rule in the Congo and their ongoing impact on the country today with Adam Hochschild, author of KING LEOPOLD'S GHOST: A STORY OF GREED, TERROR, AND HEROISM IN COLONIAL AFRICA. This nongovernmental organization works worldwide to prevent and resolve conflict. The site presents an overview of the Crisis Group's mission, briefings on Congo and monthly reports on conflict developments in the country since September 2003. The IRC is a global network of first responders, humanitarian relief workers, healthcare providers, educators, community leaders, activists, and volunteers. Their recent survey has found that 5,400,000 people have died from war-related causes in Congo since 1998. Their Web site has news and multimedia from the field in Congo and other areas they serve. The peacekeeping operation established by the United Nations Security Council in Congo operates on a budget of more than $1 billion. The largest and most expensive U.N. peacekeeping mission, MONUC is headquarted in Congo's capital of Kinshasa. The site contains press releases, photos and video about the mission. The Guardian Unlimited presents an interactive timeline tracing the history of Congo as well as current articles on elections, child soldiers, militias and more. The site also links to archived articles and letters from readers. Check here for the complete collection of the TIMES' Congo reporting. The Council on Foreign Relations, Stephanie Hanson, December 6, 2007. "Rampant sexual violence in the Democratic Republic of Congo now ranks as the worst in the world. Authorities report twenty-seven thousand sexual assaults in the eastern Congo province of South Kivu in 2006." The Council on Foreign Relations maintains a hub site for DCR news and analysis. On March 30-31, 2008 the Congo Global Action Coalition in cooperation with the U. S. Holocaust Memorial Museum held a conference to raise awareness about the ongoing conflict in the Democratic Republic of the Congo. Review the conference proceedings online. "Congo: A humanitarian disaster unfolds"
THE ECONOMIST, November, 15th 2007. "One year after the Congolese elections, civilians flee renewed fighting in the east." THE JOURNAL takes viewers on the ground in the Democratic Republic of the Congo to follow aid workers and local relief efforts that are bringing hope to a forgotten land. "The aid agencies are almost substituting for a social welfare system that hasn't operated in these areas for decades," says Dominic MacSorley, Emergency Director for Concern Worldwide, an international aid organization. Dominic MacSorley answers your questions on our blog. View a slideshow of images from The Democratic Republic of Congo by noted photojournalist Marcus Bleasdale. Also, delve into the history of the troubled land  a country almost one-fourth the size of the US. In 2002, NOW WITH BILL MOYERS followed Dominic MacSorley and Concern Worldwide as they aided refugees in Afghanistan. Watch the full program online.